Is Learning Self Meditation Important? Is learning self meditation important? I could answer this question in a variety of ways. For some individuals, this is the only way to meditate. They read books on the subject. They purchase tapes and CDs. They watch “how-to” videos on YouTube and other internet sites. This form of meditation also appeals to today’s societal demands. It's immediately accessible. It's available at any time of the day or night. It can be done without relying on someone else’s schedule. It has, seemingly, no borders. Relying on this form of meditation also allows individuals to fine-tune it. They can practice a combination of different types of meditation or stick to one. As a solo practitioner, no one can tell me I must stick to Tibetan practices or only follow the precepts of Zen. No Yogi Master can enforce his or her rules on me anymore than could a follower of Sufism or transcendental meditation. Is Solo Meditation for You? Meditating alone may not be suitable for everyone. Some people always perform best when in a group. A group gives them motivation to continue. It provides them with support. It helps them feel they're not alone. Groups are also beneficial when direction or help is required. This is even applicable when spiritual self healing is an issue. In terms of energy work, a group may be more adept at helping you with the release of self healing energy. This particularly true when the level is greater for higher self healing. The combined energy of a group may increase your ability to create a new, energy healing self. 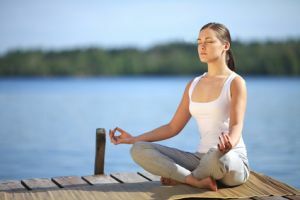 Solo meditation, however, is suitable for many individuals. Where groups are absent, it allows us to continue our practice. I find it offers a more flexible means of meditation. When I'm in control of my meditation practice, I'm able to schedule it anytime, anywhere. In doing so, I'm able to harvest the benefits of an ongoing practice. A self meditation of this nature allows me to access instantly my practice during my daily life. I don't have to wait until class. I don't have to consider the aims of a group. When we decide to meditate on our own, it's essential to pay attention to certain aspects. This applies whether we decide to meditate while walking along a forest path or while sitting comfortably on a meditation pillow. When done correctly, self meditation will help you encounter self healing energy. It may become a tool for increasing your ability to tap into the body’s own natural defense system. Meditation can help you decrease stress and raise the ability of your immune system to fight off potential health problems. At the same time, it introduces you to another kind of healing, one that is beneficial to your other self – spiritual self healing. Return to Home Page "Spirituality and Health" from "Self Meditation"